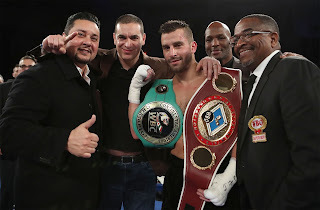 Press Release: By DAZN – LAS VEGAS (April 10, 2019): David Lemieux (40-4, 34 KOs) will make his 168-pound debut when he takes on John “The Gorilla” Ryder (27-4, 15 KOs) in the scheduled 12-round co-main event of Canelo vs. Jacobs. The card will also feature the returns of Vergil Ortiz Jr., Pablo Cesar “El Demoledor” Cano, Joseph “JoJo” Diaz Jr., Sadam “World Kid” Ali and Lamont Roach Jr., in separate bouts. The event will take place Saturday, May 4 at T-Mobile Arena in Las Vegas and will be streamed live exclusively on DAZN. Lemieux, 30, was last seen on the televised pay-per-view undercard of Canelo vs. GGG 2 when he scored a first-round knockout victory against Gary “Spike” O'Sullivan. The native of Montreal, Canada promises to be stronger than even in his super middleweight debut. Canelo vs. Jacobs is a 12-round fight for the WBC, WBA, Lineal, Ring Magazine and IBF Middleweight World Titles presented by Golden Boy in association with Matchroom Boxing. Lemieux vs. Ryder is a 12-round super middleweight battle presented by Golden Boy in association with Eye of the Tiger Management and Matchroom Boxing. The event is sponsored by Tecate, "THE OFFICIAL BEER OF BOXING" and Hennessy "Never Stop. Never Settle." The event will take place Saturday, May 4, 2019 at T-Mobile Arena in Las Vegas and will be streamed live exclusively on DAZN. 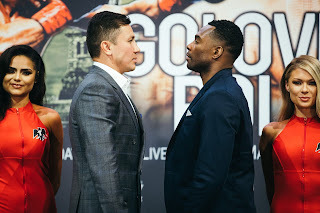 Material Courtesy of : DAZN/ Photo Courtesy of : Golden Boy Promotions Used with permission.